Newborn sleep patterns have been the subject of numerous scientific studies. In the past, parents relied on information from their parents or friends concerning when and how long their babies should sleep. Today, scientists provide a little more help. The questions scientists have attempted to answer include the following. How much time does the average infant spend sleeping? When do they start sleeping through the night? Does swaddling have a measurable effect? What dietary factors are involved? How Much Sleep Needed for Newborns? One of the scientific conclusions is something that mothers and grandmothers have known for years. Babies are different. 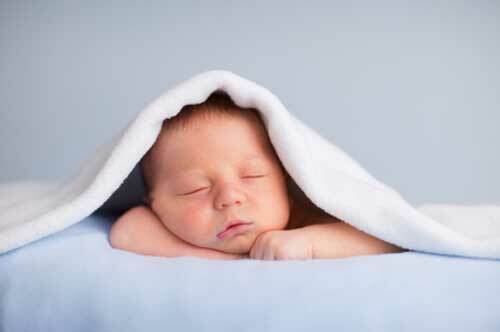 While the average 0-1 month old sleeps 16-18 hours per day, some infants doze for as few as 9 hours. Others snooze for 19 out of the 24. At 6 months the average is 14.2 hours. During the first year, the amount of time spent sleeping at night increases, as daytime napping decreases. Some researchers have found that nighttime sleeping begins to increase within the first two weeks of life. The newborn sleep schedule is different because production of hormones governing circadian rhythms is not completely rhythmic and because of the infant’s need to eat more often. The adult circadian rhythm causes wakefulness during the daytime and sleepiness at night. The hormones melatonin and cortisol mainly control people’s rhythms, which also naturally vary from one person to another. Adults begin producing more melatonin at some time during the evening. That makes them sleepy. Cortisol production increases as the morning approaches. That wakes you up. The increase in nighttime melatonin production does not begin until around three months of age. It may take even longer for changes in cortisol to make babies more wakeful during the day. Once again, there is a wide range of sleeping behaviors for perfectly normal infants. Some begin to be more wakeful during the day within the first few weeks. Most infants start sleeping for longer periods of time between the hours of midnight and 8am by the time they reach two weeks of age, but they will still wake at some point during the night to eat for several months. Swaddling did not have a measurable effect on the amount of time spent sleeping, on the infant’s heart rate or spontaneous arousal in one study of newborn sleep patterns. There are some concerns about the safety of swaddling, which entails wrapping the baby tightly in a blanket. Swaddling did seem to have a calming effect on 3 month old infants who had not previously been swaddled. But researchers were concerned the decreased arousal and heart rate could increase the risk of sudden infant death syndrome. The newborn sleep schedule revolves primarily around eating. Hunger is not the only cause of wakefulness or crying, but it is the usual cause. Breast-fed newborns typically nurse 8-12 times in a 24-hour period during the first month of life or every 1.5 to 3 hours. The number of feedings will decrease as the months go by. The first response to crying or wakefulness should be to check and change the diaper. The second should be to offer food. The more often the baby nurses during the first few weeks, the better the flow of breast milk will be. The newborn sleep schedule for formula-fed babies may be a bit different. Breast-milk is the considered the best way to feed a baby. Pediatricians encourage their patients to breast feed, but not to the point of risking malnutrition. The typical schedule for formula-fed newborns is 2-4 ounces every two-four hours. Breast milk contains melatonin (mentioned above) and DHA, an essential fatty acid necessary for normal brain development. DHA has an effect on infant wake-sleep cycles according to scientists. We know that melatonin makes people sleepy. A recent study showed that laughter increases the amount of melatonin in the mother’s breast milk. A mother frustrated with the typical newborn sleep patterns might have trouble laughing, but it could be the best medicine for her and for her baby.